Cetinje, is a city and old royal capital of Montenegro. It is also the historic and the secondary capital of Montenegro, where the official residence of the President of Montenegro is located. It had a population of 13,991. Cetinje is the center of Cetinje Municipality with a population of 16,757. The city rests on a small karst plain surrounded by limestone mountains, including Mt. Lovćen, the Black Mountain from which Montenegro derives its name. 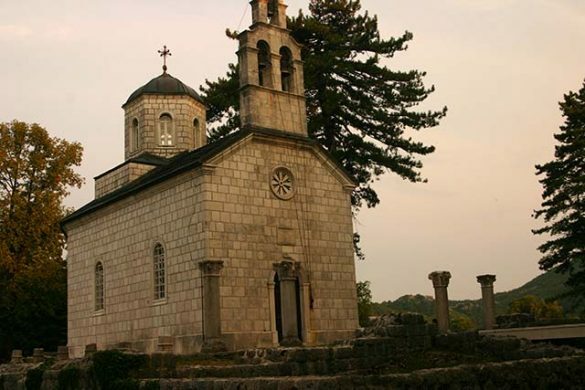 Cetinje was founded in the 15th century and became a center of Montenegrin life and both a cradle of Montenegrin culture and an Orthodox religious center. Its status as the honorary capital of Montenegro is due to its heritage as a long-serving former capital of Montenegro. Visiting Cetinje is really about understanding Montenegro and it’s history. Cetinje made great progress under the rule of Prince Nikola I Petrović when numerous public edifices were built. Those include the first hotel, called ‘Lokanda’, then the new Prince’s palace, the Girls’ Institute and the hospital. This period also saw the first tenancy houses. In the 1860 census Cetinje had 34 households. After initially holding off Ottoman incursions in 1852 and 1853, Cetinje was captured by Ottoman Omar Pasha’s forces during the Montenegrin Ottoman War of 1861–62. Ottoman rule over Montenegro did not last much more than a decade however, as 14 years later the “Great War”, the third successive contest between the two nations, ended in Montenegrin victory, with most previously Montenegrin territory returning to their control. Montenegrin independence was recognized at the Congress of Berlin of 1878 and consequently Cetinje became the capital of a European country. Between 1878 and 1914 Cetinje flourished in every sense. Many renowned intellectuals from other South-Slavic parts came to stay there and made a contribution to the cultural, educational and every other aspect of life. Montenegro was proclaimed a kingdom in 1910. This had a great effect on Cetinje’s development. At this time the Government House, the symbol of state power, was built. The population census from the same year recorded a massive growth in the world’s smallest capital, registering 5,895 inhabitants. In the Interwar period, Cetinje expanded its territory, as it was now a center of the Zeta region. 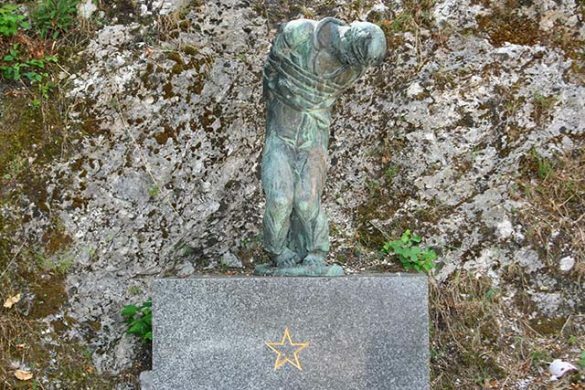 But when it was decided by the Parliament of Montenegro that the administrative organs should be located in Titograd (previously and presently Podgorica), Cetinje went through a harsh crisis. By building certain industrial sections and at the same time neglecting the development of the city’s traditional and potential cultural and tourist capacities, the chance to create a strong basis for more solid prosperity was lost. Cetinje is situated in the karst field (Cetinje field) of about 7km², with average height above sea level of 671m. It is 12 km (7 mi) of airline far from Adriatic Sea and 15 km (9 mi) from the Skadarsko Jezero lake. Now, it is on the main road Podgorica-Cetinje-Budva, which makes it open to the inside of Montenegro and Montenegrin coast. Cetinje, as a settlement has existed for 500 years, which is not much compared to the development of the coastal agglomeration of the ancient period in the immediate surrounding. However, these five centuries, the whole history of a people, who, through the development of city recorded moments of their origin, ascent, stagnation and downs. For Cetinje as urban agglomeration, can be said to have formed suddenly, which makes it very specific. In fact, since the seventies of the nineteenth century, for almost fifty years, there was, in the urban context, designed and typological characteristic areas formed with urban type residential home ground floor and storey house with developed attic, created and developed in closed urban blocks, where line of life in them was street – house – garden. national, economic, social, cultural, societal and spatial superstructure which caused increasing of economic power and the reorganization and improvement of the state apparatus and the authorities. During this period, Cetinje, as the old royal capital, gains in an even greater national and international significance and experiencing its rapid socio – economic, institutional, and urban development. On the basis of that and the facts about today’s relatively preserved old urban heritage, is justified the fact which Cetinje ranks among the cities with significant architectural heritage. Close to Cetinje (about 5 km (3.1 mi)) the Lipa cave (Lipska pecina) is situated, one of the biggest caves in the former Yugoslavia. Its entrance is located in the village of Lipa and it ends in the mountains directly over the Adriatic Sea. After project of Municipality of Cetinje and company ‘Lipa Cave‘, the cave is restored and opened for public in July 2015. Today the cave is one of the biggest tourist attractions in Cetinje and Montenegro, similar to Postojna Cave in Slovenia. 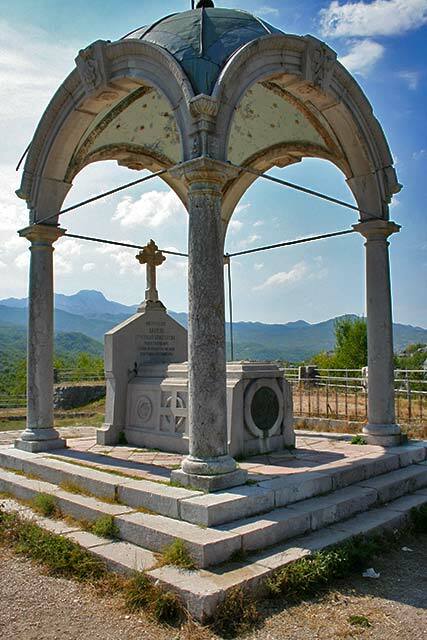 One of the most visited destinations of Cetinje is the mausoleum of Petar II Petrović-Njegoš on the mountain Lovćen. 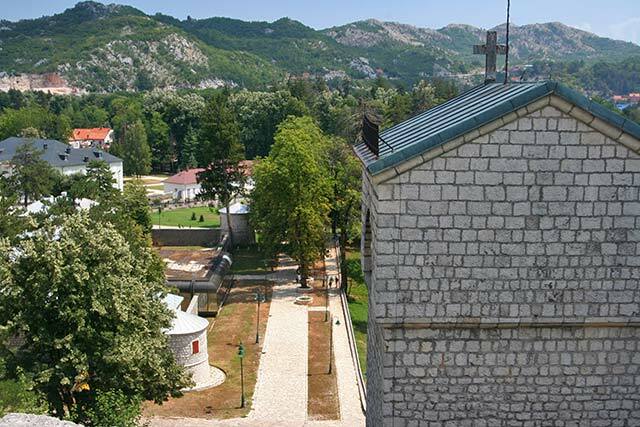 The mausoleum is accessible by car from Cetinje, which is 13 km (8.1 mi) away. Apart from the surrounding natural environment of beech, oak and linden tree forests, there is a unique freshness of Lovćen national park. The mausoleum is situated at the Jezerski vrh (Jezerski peak), in the height of 1,660 m (5,450 ft), and it officially represents the highest mausoleum in the world. Although Podgorica is the capital of Montenegro, Cetinje is seat of numerous national institutions of Montenegro. 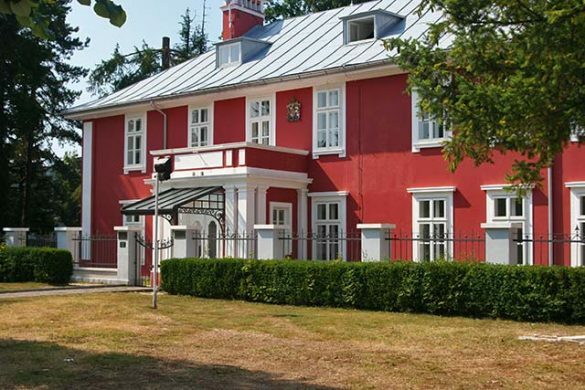 The President of Montenegro has his official residence in Cetinje, in the former heir’s palace, called the Blue Palace owing to the colour of its walls. Cetinje is the seat of Montenegrin Ministry of Culture, National Museum of Montenegro, National library, State archives and from 2017 there will be a seat of Ministry for Foreign Affairs. Cetinje has been the cultural and educational center of Montenegro for five centuries. 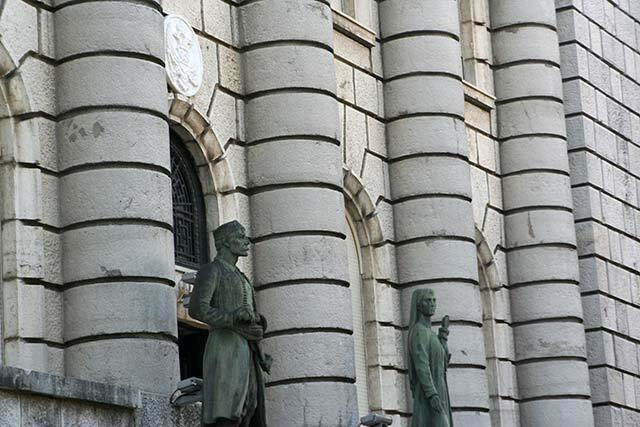 There are five republic institutions: Đurđe Crnojević Central National Library, the National Museum of Montenegro, the Archives of Montenegro, the Republic Institute for Preserving Cultural Heritage and the Zetski Dom Montenegrin Royal National Theater. All these institutions keep, process, and provide public access to enormous literary treasure, and protect both mobile and immobile cultural monuments throughout Montenegro. The oldest – and for a long time the most important – cultural institution in the town is the monastery of Cetinje. Montenegro. Numerous museums and the huge fund of museum items that are kept there established Cetinje’s reputation as a museum town. Cetinje has always been a cultural center. Every second year the international art exhibition called Cetinje Biennial is held there. Its founder is Prince Nikola Petrović, great grandson to King Nikola I.
Cetinje is also the seat of the Eparchy of Montenegro and the Littoral of the Serb Orthodox Church, and Montenegrin Orthodox Church. Cetinje as the former capital of Montenegro can claim the honor of the city with the first official hotel in Montenegro. This legendary hotel, formerly known as “Lokanda” and once the residence of the American mission to Montenegro, unfortunately no longer exists. It was irreparably damaged during the earthquake in 1979. After the official recognition of Montenegro in the Berlin treaty in 1878, there arose shortly after the plan for the development of the tourist economy in Montenegro. These plans focused on three areas: Cetinje with its environment, Kotor and Herceg Novi. Cetinje for the fact that it was then the former capital of Montenegro, with many diplomatic relations. Kotor for its rich cultural history with its abundance of medieval architecture. And for Herceg Novi the choice was made by the lush Mediterranean green, location and the presence of the nearby climatic spa of Igalo with its seaside resort. 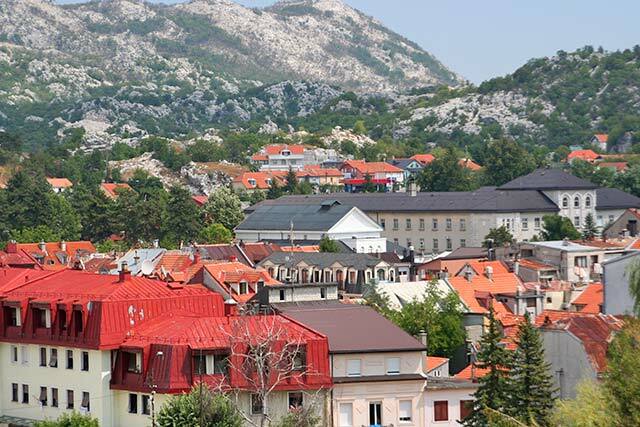 Few people stay in Cetinje for a long time and most of them visit Cetinje as a trip from the coast. That is why the accommodation offer is also much smaller than on the coast. And in general, the more historical character of the city persistently. With a height of 610 meters and lush greenery, Cetinje is an ideal place for a night of rest and sleep in the summer, with only half an hour’s drive to the sea and many attractions in the area. La Vecchia Casa – La Vecchia Casa is located in the center of Cetinje, surrounded by a lush garden. It offers accommodation with free Wi-Fi and free private parking. All accommodation units comprise cable TV, a wardrobe, a seating area and a private bathroom. The apartments also have an equipped kitchen with a dining table. Some units are air-conditioned. Facilities : Free Wi-Fi, Free Parking, Picnic Area, Outdoor furniture, Garden, Massage (surcharge), Laundry, Airport Shuttle. Guest House Pansion 10 – Located in Cetinje, a 6-minute drive from the Lovćen National Park, Guest House Pansion 10 offers free WiFi, a shared terrace and free bikes. Private parking spaces are available free of charge nearby. Rooms at Pansion 10 are comfortably furnished and come with a balcony, flat-screen TV and a small seating area. Each bathroom has a shower and free toiletries. Guests at the property can use a fully equipped shared kitchen. There is a supermarket within 5 meters of the property, and several restaurants, bars and cafés are 100 meters away. Facilities : Free Wi-Fi, Free Parking, Balcony, Terrace, Airport Shuttle, Tea / Coffee Maker, Free Bicycle Rental, Ironing Facilities, Laundry (surcharge), Wake Up Service, Express Check-In / Check-out. Hotel Sport IN – Hotel Sport IN is part of Sportski Centar and is a few minutes walk from the center of Cetinje. It offers practical rooms with free Wi-Fi.The hotel is near the bus stop and offers you gyms and equipment. Restaurant and bar Armonie Mediterranee consists of 2 large rooms with space for a total of 250 people. Domestic and professionally prepared Italian specialties are served. Facilities : Free Wi-Fi, Free Parking, Bar, Restaurant, Fitness Center, Luggage Storage, Laundry (surcharge), 24-Hour Front Desk. period, visitors can attend the gigs of regional artist stars at the most significant city locations, but in the villages too. During the ‘Summer at the Old Royal Capital’, there are festivals like ‘Royal Fest’ (hard rock, alternative), ‘Cetinje Jazz Fest’, ‘Espressivo’ (classical music), ‘Cucka jeka’ (Kobilji Do), ‘Riječka noć’ (Rijeka Crnojevića), ‘Njeguško ljeto’ (Lovćen and Njeguši), ‘Folklor’ etc. Events during the ‘Summer at the Old Royal Capital’ attend about 50,000 visitors. There are more festivals and events during the whole year, like ‘Christmas Concerts’ (7/8 January), Independence Day event (21 May), ‘MIT Fest’ (alternative theater festival) etc. The best results in the past were achieved before WW2, when they won few Montenegrin Championships, and in 1956 in qualifications for the first national league. In 1947, Lovćen was juvenile club champion. FK Lovćen now competes in the Montenegrin First League. During the season 2013/14, Lovćen won second place. On 21 May 2014, Lovćen won the Montenegrin Cup, which was the first national trophy in the club’s history. Formed at 1949, Handball club “Lovćen” is among oldest handball clubs in Montenegro. During the decades, especially from 80’s until today, Lovćen became most successful Montenegrin men’s handball club, but the most trophied team from Old Royal Capital Cetinje. There is huge number of great Montenegrin, Yugoslav and European players which produced handball school of Lovćen. From the 1988 until today, Lovćen played 23 seasons in the First Handball League of SFR Yugoslavia, FR Yugoslavia and Montenegro. Five times, club from Cetinje won the champions’ title – in the seasons 1999/00, 2000/01, 2006/07, 2011/12 and 2012/13. “B” team of Lovćen is HC Cepelin-Lovćen, which in past competed in First league. Today, Cepelin-Lovćen is playing in Second league. During the past, in Cetinje existed Volleyball club “Lovćen”. It competed in Republic League and was among best Montenegrin clubs in that sport. VC “Lovćen” is not active anymore. Today, there are dozens of active clubs. Table-tennis club “Lovćen” is among two most successful table tennis clubs in Montenegro during last four decades. Other clubs are Racing team “Lovćen”, Judo club “Crnogorac”, Karate club “Lovćen”, Boxing club “Lovćen”, Women basketball club “Lovćen” and others. Podgorica airport is some 50km away, and has flights throughout the year to Belgrade, Budapest, Zurich, Frankfurt, Ljubljana, Paris, Rome and Vienna. Maybe the best way to get to Cetinje. It is less than hour drive from both Podgorica and Budva. Buses to domestic destinations are very frequent despite the fact that the bus station does not have a ticket counter (you can always buy your ticket on the bus though). rarely legal, and rarely safe. The road from Kotor to Cetinje is a curvy, mountainous road, and mist or ice are not uncommon. The road from Budva to Cetinje is in relatively good condition with 3 lanes in some parts. The road from Podgorica to Cetinje is in fairly good condition. Cetinje, especially the historical center of the city, is small enough, and everything is within walking distance. The bus station is less than five minutes walk from all the key historical sites. 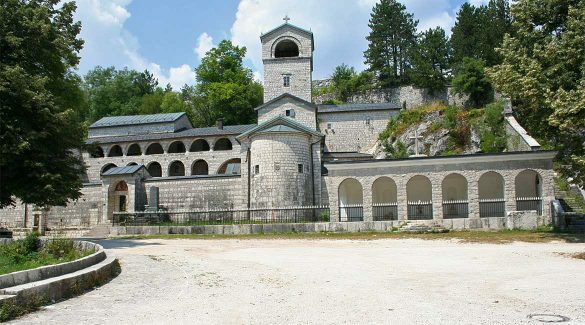 Cetinje Monastery – The most famous Serb Orthodox monastery in Montenegro. Re-built in 1785. Features several relics including the remains of Saint Peter of Cetinje, the right hand of John the baptist, the remains of Peter II Petrovic, and the crown of Steven Uros IV Dusan, midevil emperor of Serbia. Vlaška Church – Built in 1450. Fence made out of barrels of captured enemy rifles. 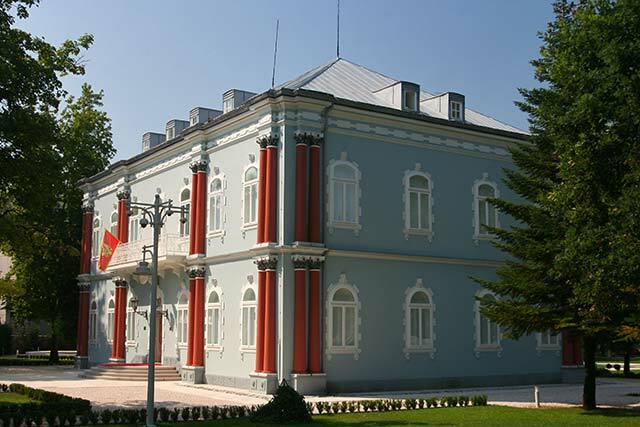 Ethnographic Museum – King Nikola’s’ Square. 9am-3pm. – Traditional clothing from Montenegro. State Museum, (King Nikola’s’ Square). 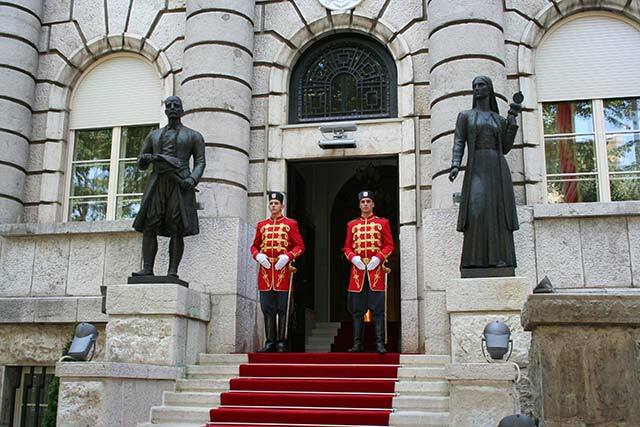 9am-3pm – Former residence of Nikola Petrovic I, king of Montenegro. Looted during World War II. Biljarda Hall, (Opposite the National Museum) – 1832 residence of Peter II Petrovic. Now a museum dedicated to him. National Museum of Montenegro, Novice Cerovica. 9am-5pm – History section and art section. Orlov Krs, Grave of Vladika Danilo, – If you are willing to take the 10-minute walk up the hill on the path that starts on the left of the Cetinje Monastery, you will not be sorry because you will be rewarded with beautiful views of Cetinje from above. Cetinje embassies – Since 1878th when the Berlin Congress recognized Montenegro’s independence, a number of major European countries began to establish diplomatic relations with the new state. Today in Cetinje, we can distinguish several buildings by its successful architectural solutions: former Austro-Hungarian, Russian, French, Italian, Turkish and English mission. 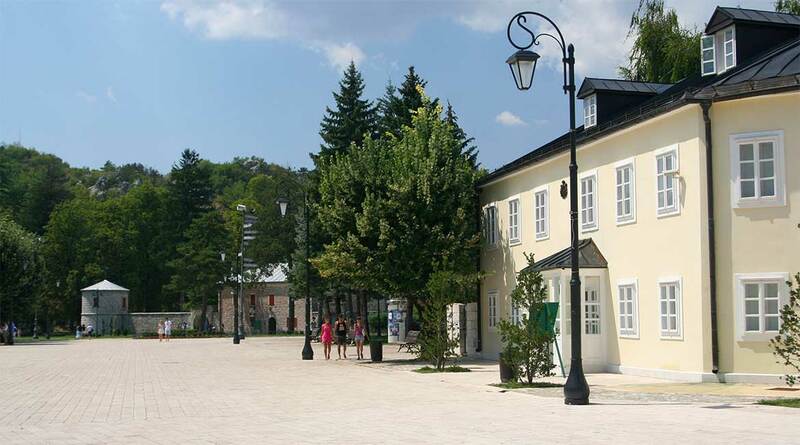 There is a cumulative €10 ticket that allows you to visit all the museums in Cetinje. You can buy the ticket at each of the museums. If you are looking for a genuine Montenegrin souvenir, Cetinje is the town. Other than that, Cetinje is not really a shopping resort, leave that for coastal towns or Podgorica. Cetinje is the right town to try out traditional Montenegrin cuisine, e.g. veal filled with cheese and ham. Despite the name of the country, make sure you try the excellent Adriatic fish and seafood. Montenegrin quality wine is a must try. The best known Montenegrin wines are the premium “Vranac”, “Pro Corde”, “Krstač”, “Cabernet”, “Chardonnay” and the famous home made Crmničko red wine. Grape brandy (rakija) “Montenegrin loza”, “Prvijenac”, “Kruna” or home made grape brandy (lozova rakija, lozovaca) is also great. Budva — the Montenegrin touristic metropolis on the Adriatic Sea is located some 20 kilometer south of the Boka Kotorska. Mrtvica Canyon — “Treasury of Nature” title is without doubt the right tributary of the Mrtvica Canyon. Moraca Canyon — Morača is one of most beautiful river canyons in Montenegro which separate the Moracke mountain range from the Sinjajevina range. It originates in northern Montenegro, under Rzača mountain. It generally flows southwards for some 113 km, before emptying into the Skadarsko Jezero. Duklja — 13 km northeast of Podgorica, ruins of a fortress erected at III century B.O.T. Medun — ruins of the old roman city that preceded Ribnica and Podgorica. Bar — Bar the closest coast town from Podgorica known for it’s old town, is the most significant among the numerous cultural-historical monuments in Montenegro, what witnesses to the turbulent history of this town. Lipa Cave — In the near of Cetinje is the Lipa Cave or Lipska Pecina, one of the biggest caves in the former Yugoslavia. It starts in the village Lipa and end in the mountains directly over the Adriatic Sea. The cave is just restored and opened for public since 2014. Njegusi — Njeguši, picturesque old Montenegrin village, and the Njegoš’s birthplace. Rijeka Crnojevica — Rijeka Crnojevića, small village on the river of the same name. Great place for a one-day trip, as they have a few excellent restaurants. Moracke planine — Morača Mountain range is located in the central part of Montenegro. They extend east to northwest beginning at the Tara River canyon near Kolašin town, and then along the series of beautiful peaks. Kucka krajina — It is almost untouched, pristine, remote and quiet. Region called Kučka krajina or sometimes Žijovo situated north-east of Podgorica the capital of Montenegro, next to the Albanian border, is one of not so known gems of the Montenegrin Dinarids. Skadarsko Jezero — Skadarsko Jezero is the largest freshwater lake in the Balkans, two thirds of which is in Montenegro and the remainder in Albania. It is surrounded by dramatic karst mountains and hosts a thrilling array of wildlife with more than 260 species of birds, traditional fishing villages, islet monasteries and pristine beaches. It has been a protected National Park since 1983 and was added, in 1996, to the World’s List of Wetlands of International Importance by the Ramsar Convention.